While it’s on the calendar as a special day, the most I can seem to find online about Plant Something Day is a bunch of links for online greeting cards. But that doesn’t matter, because any excuse to plant something and add a touch of lively color to the world is a good excuse! Since there isn’t much to go on in the way of Plant Something Day history, I think the best way to kick off the day is to learn a little something about planting. I am a huge fan of houseplants and plants in pots. The pots can add a bit of elegance to an otherwise simple plant, and you can control the health of the soil better than ground dirt. If you’d prefer an outdoor garden over houseplants, raised planter beds are an increasingly popular method of outdoor gardening in areas where the natural soil makes it nearly impossible to grow anything other than weeds. – …greatly reduced soil compaction. Plant roots need air. – Plants can be spaced a little closer together in a raised bed because you don’t need places to step. This increases productivity per square foot of bed and reduces weeding when the plants begin to mature. – Raised beds tend to drain away excess moisture better than ordinary garden beds. This is another advantage that helps the plant roots to breath. – Soil conditions and types can be controlled more efficiently in a raised bed and they can be varied easily from bed to bed. Raised beds are the answer when topsoil is thin. – Water, fertilizer, compost, mulch, etc. can be applied more carefully because they only need to be applied to the garden beds. – Various studies have shown that raised garden beds produce 1.4 to 2 times as much vegetables and flowers per square foot as ordinary beds, due mainly to the above advantages. You can have a smaller and more manageable garden that produces more goodies for your table. HGTV has some excellent advice on How to Plant a Container Garden on their website. Choose a mixture that provides a good combination of excellent drainage and aeration. Once you’ve got your soil, it’s time to pick out the beauty you’ll be planting on Plant Something Day this coming May 19th. 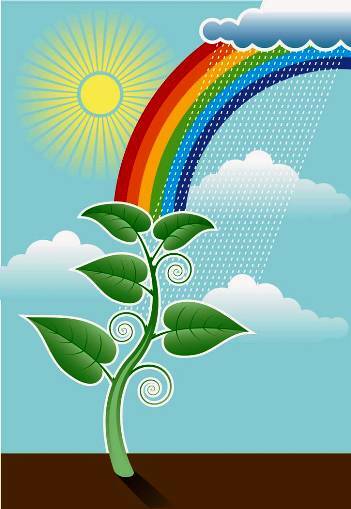 Select plants that are compatible in terms of light, water, growth and the conditions in the chosen site. Don’t mix a shade- and water-lover like impatiens with a dry-and-sunny plant like thyme. Some plants like mint are such aggressive growers they need a pot of their own. Pay close attention to watering. For containers in sunny, hot or windy areas, watering twice a day may be necessary. A plant that has outgrown its pot will also need more frequent watering. Consider using a water-absorbing polymer; it will improve the moisture retention of the potting soil. Follow the directions on the package. Top-dress your plants with mulch and a slow-release fertilizer. You’ll be reducing the evaporation rate and eliminating regular feedings. Happy Plant Something Day! 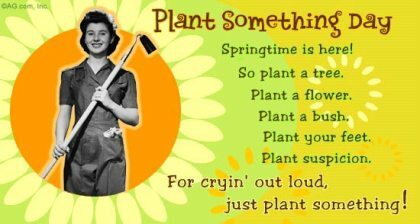 Get out there and do some planting!! This entry was posted on Sunday, May 6th, 2012 at 1:25 PM	and is filed under Misc.. Both comments and pings are currently closed.